Jill Harrison Berg is a leadership coach and school improvement consultant. With Berg's support as a critical friend, professional learning leader, and strategic planning partner, education leaders are able to strengthen their capacities for creating powerful, coordinated systems that maximize the leadership potential of teachers. Berg also consults with various local, statewide, and national institutions on matters of research and policy. Since 2013, she has served as a faculty member for the Network to Transform Teaching, a networked improvement community of cross-stakeholder teams representing 10 states that was convened by the National Board for Professional Teaching Standards to apply Carnegie's principles of improvement science to learn together how to bring accomplished teaching to every student every day. Currently, she is also co-principal investigator on a research study through the Consortium for Policy Research in Education to explore the range of ways programs across the United States support and develop teachers as leaders and to examine the impacts of such programs. Other institutions that have tapped Berg's expertise include the Massachusetts Department of Elementary and Secondary Education, Washington's Center for Strengthening the Teaching Profession, Educational Development Corporation (EDC), WestEd, and the National Research Council. Berg has been an educator of leaders at all levels. She began her career in the classroom, with a passion for teaching elementary and middle grade students to be leaders who take ownership of their own learning and strive to be a positive influence on learning of others. After earning National Board Certification, she left the classroom to pursue a doctorate, and continued to support the development of teacher leaders and other school leaders through various institutions of higher education and nonprofit organizations, including the Boston Plan for Excellence, Teachers21, Simmons College, Brandeis University, and University of Massachusetts in Boston. Throughout more than 25 years working in educational practice, research, and policy, Berg has written many articles on the topics of teacher leadership, teaching quality, and leadership development, and is the author of Improving the Quality of Teaching Through National Board Certification (Christopher-Gordon Press, 2003). She earned her doctorate at the Harvard Graduate School of Education while working as a researcher with the Project on the Next Generation of Teachers. She also holds a B.A. from Harvard University and an M.Ed. from Lesley University, and was one of the first teachers in Massachusetts to become a National Board Certified Teacher (1998). 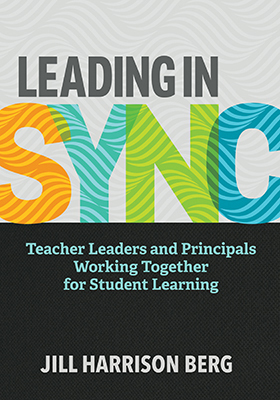 This insightful book offers real-world examples, reflection questions, strategies, and downloadable tools and templates to help teacher leaders and principals learn to lead well together.